Hello Friends! The holiday season is rapidly approaching. Thanksgiving is this Thursday, and after that we will be decking the halls to prepare for Christmas! 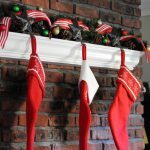 Have you started to prepare for the holidays? If you are looking for some easy and creative way to wrap your gifts, you have come to the right place. 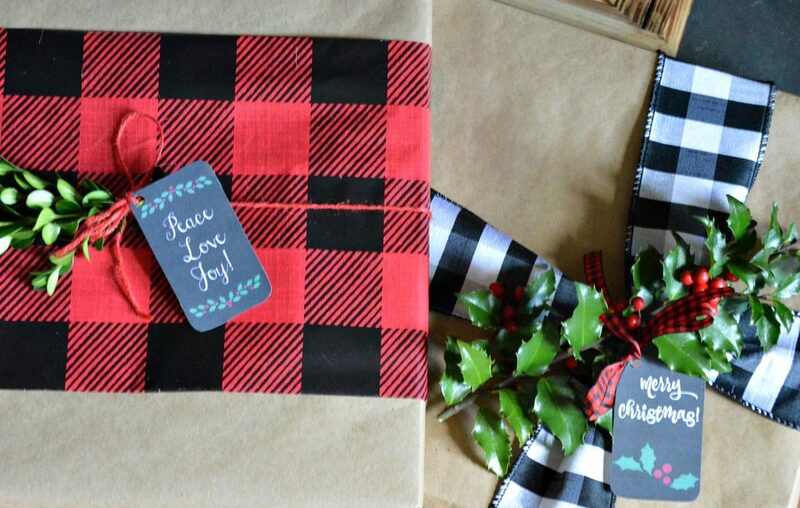 I am thrilled to be joining a talented group of ladies for a Christmas Wrapping Paper Blog Hop. Thank you to my friend Nancy from Slightly Coastal for organizing this fun hop! One of the best things about Christmas is gift giving. There is a great sense of satisfaction and pride in watching the joy on your loved ones’ faces as they open up the gifts that you thought that they may enjoy. Of course, you can’t just hand your loved one a toy or a sweater, unwrapped. 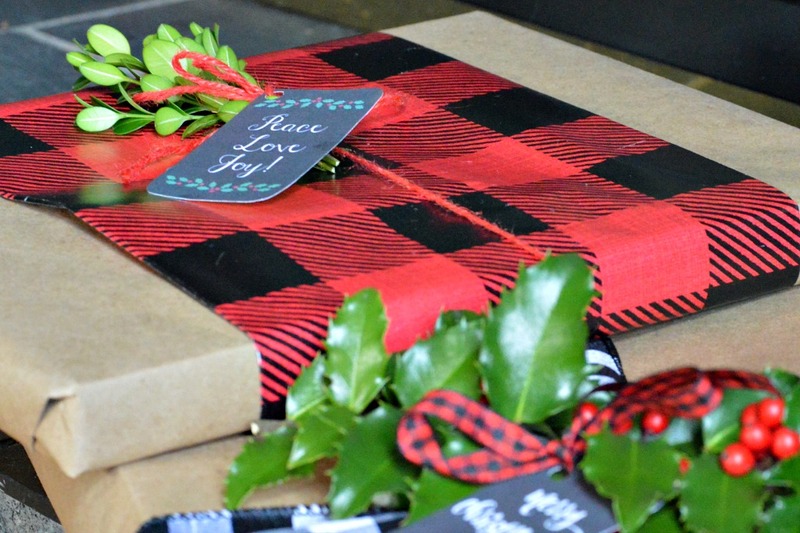 The gift wrapping process is just as much a part of the holiday season as Santa Claus, mistletoe, and snow. 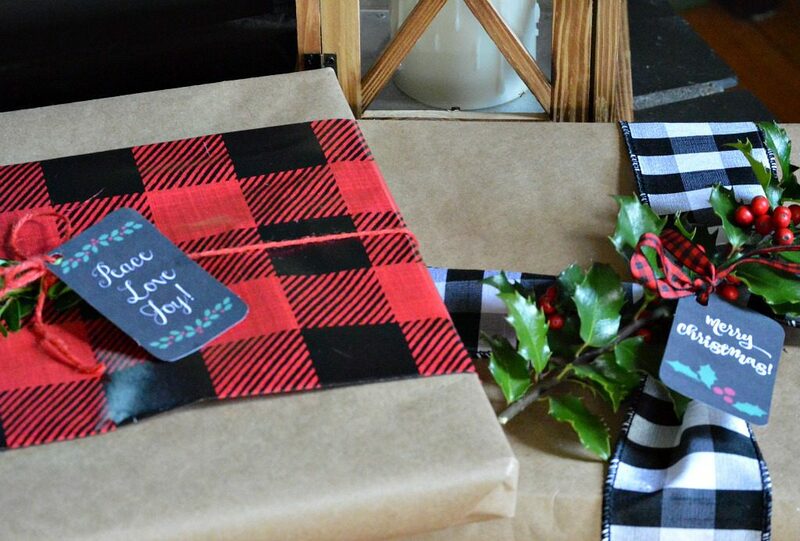 Craft paper makes great gift wrap. 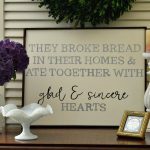 It provides a neutral background that can be accessorized with a variety of ribbons, wrapping paper, natural elements, and gift tags. Just let your personality and creativity lead the way! 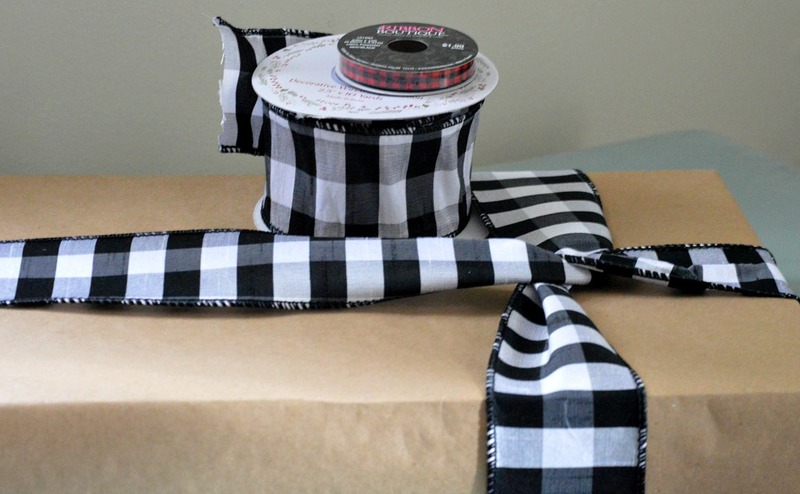 I chose to go with a farmhouse style wrapping by using these simple buffalo check ribbons. A piece of holly from my yard adds an element of nature, along with strong pops of color. I love the mixture of patterns, colors, and textures. 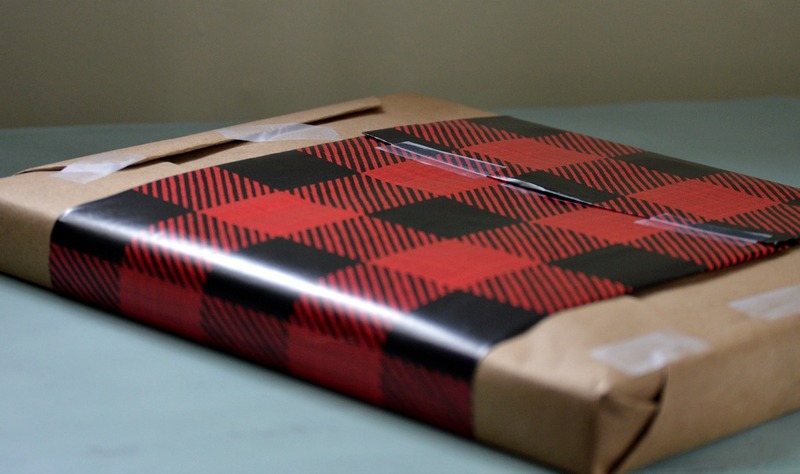 Wrapping paper can also be used as an accent on this blank canvas. 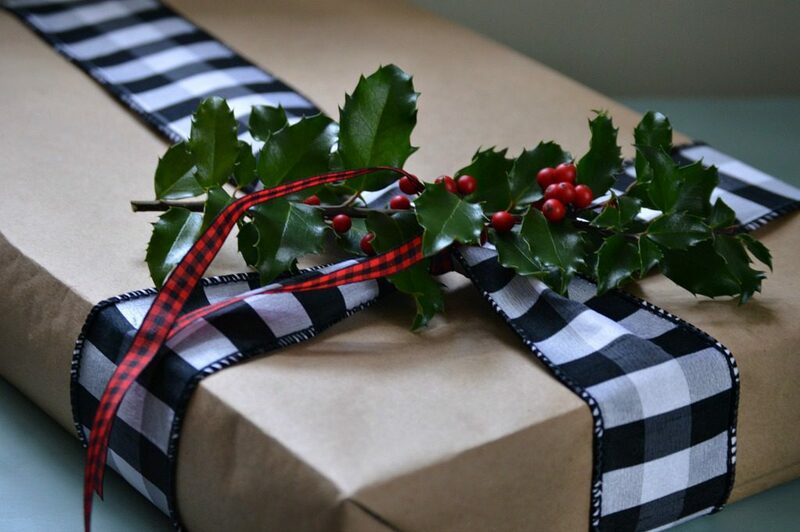 I found this great buffalo plaid gift wrap at Target. 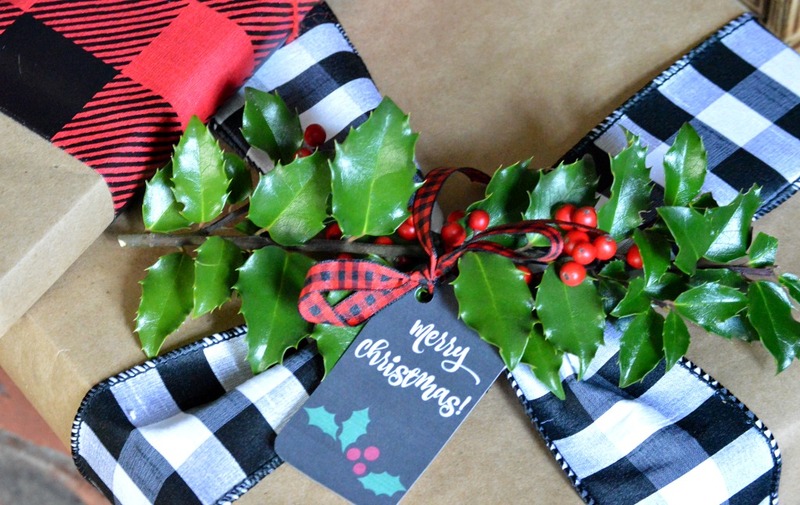 Simple red twine with a few sprigs of fresh boxwood keep this gift festive, yet uncomplicated. Thank you for visiting today. Before you leave, I have a little gift for you. Please enjoy these festive holiday gift tags. Just download, print, and enjoy! Wishing you all a wonderful holiday season! Be sure to check out these amazing ladies and their creative gift wrap ideas! So beautiful! I love this so much. The bright pops of red really set things off. Thanks so much for hopping with me! Thank you so very much for your kindness, Nancy! I am so appreciative to join in with such an amazing group of ladies. Best wishes for a beautiful holiday season! 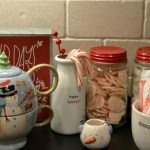 Lynne – Thank you for the great gift wrapping ideas – and especially the free download of your tags! I will definitely be using them. You have certainly given me some ‘creative gas’ to really help with Christmas gift wrapping. For the first time ever, I have even started my Christmas shopping early! We too are lovers of kraft paper and buffalo check! 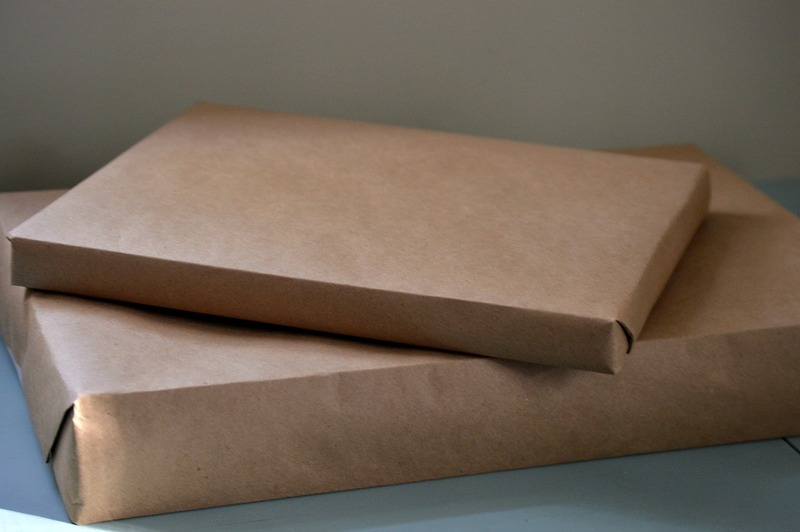 You are so right about the paper being a blank canvas – love how you wrapped the checked paper around the kraft paper. Your embellishments and tags are super cute too! We wish you and yours a very Merry Christmas and holiday season! I appreciate your kind words, Vicki and Jenn! I hope you and your families are enjoying a wonderful holiday season! Merry Christmas! The plaid ribbon is great! It works so well with the kraft paper. Hope you have a great Thanksgiving week and Christmas season! Thank you so much, Tylynn! I love finding new ribbon to try! I hope you are enjoying a wonderful holiday season! I love how you incorporated natural elements from your yard! Thanks for these great ideas! Thank you so much, Cindy! It’s so much fun to incorporate a little bit of nature. Best wishes for an wonderful holiday season! Hey there Lynne with an e! What great ideas! Why haven’t I thought about popping out to my yard for a sprig of Holly or something similar. I do love the unexpected little something that it graced your packages with! Thanks for the inspiration. Hugs, Lynn without an e! What wonderful ideas! I love all the pics and pinned your poster. I just wish I wasn’t such a klutzy wrapper. Using butcher paper is a great idea, especially for people that don’t necessarily celebrate Christmas. You can customize the gifts easier. Thank you so much for your kind words, Rebecca! I appreciate your comment. Best wishes for a wonderful holiday season! I used to have a fantasy about somehow making gift wrap for the whole family after my children grew up. Clearly that is not going to happen, but I could do some of these things. 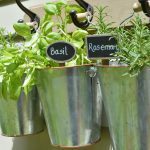 I am so glad that these are ideas you can use! I hope you and your family have a wonderful holiday season! I bought a roll of brown craft paper a week or two ago, hoping to try a couple of these.